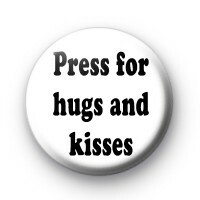 Custom black and white badge with the text press for hugs and misses. Custom designed badge for Michael Hill. Standard 25mm badge hand made in the UK using metal badge components, a plastic coated printed design & a copper pin back.